First of all, I promised to report back after the electoral college vote, just to give the real final results, but I didn’t. There were no “faithless electors” this time around, as fun as that always is, so the end result was as expected from election night. Obama 332, Romney 206. 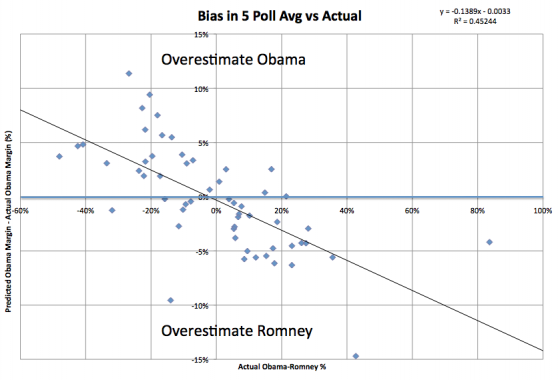 There is no clear overall bias toward either Obama or Romney. The overall count gives 25 jurisdictions where my 5 poll average overestimated Obama’s support, and 31 jurisdictions where my 5 poll average overestimated Romney’s support. 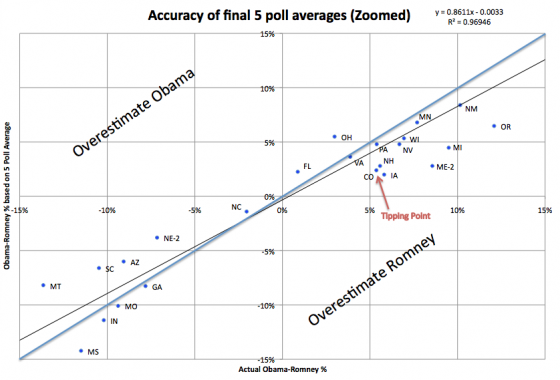 If anything, on an overall basis then, there is a slight bias in favor of Romney. But that isn’t the real bias here. Lets look at this again partitioning based on who won. 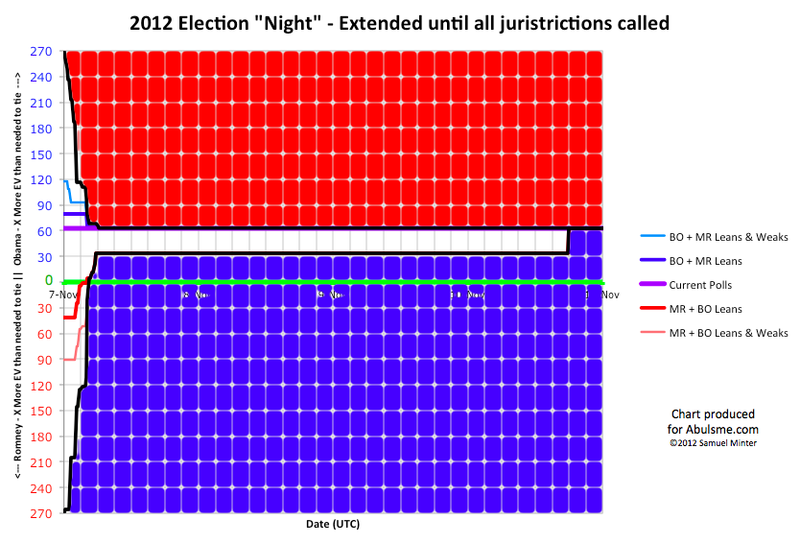 Romney won 27 jurisdictions. Of those, 7 overestimated Romney’s support, while 20 overestimated Obama’s support. Obama won 29 jurisdictions. 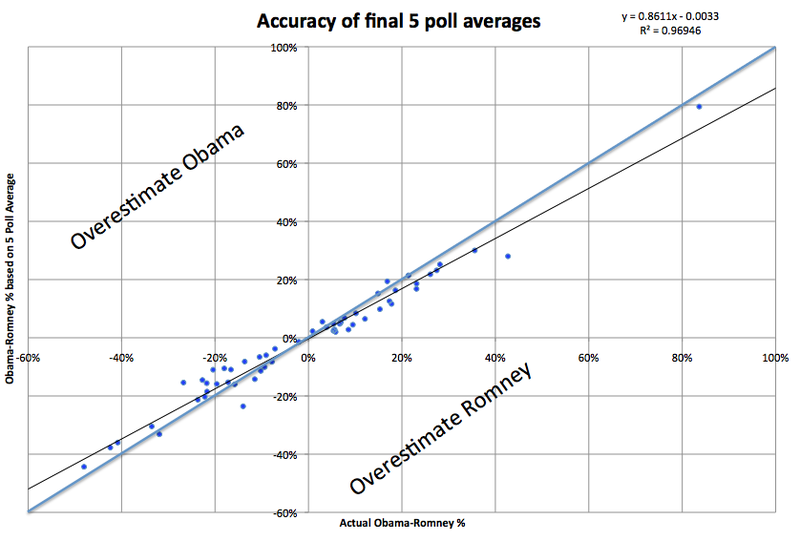 Of those, 5 overestimated Obama’s support, while 24 overestimated Romney’s support. So the overwhelming pattern here is that although there are clearly exceptions, in general, the polls overrepresented the support level of the person who lost the state. In other words, the polls are not biased toward either candidate. The polls are biased toward showing a CLOSER RACE than the actual results. 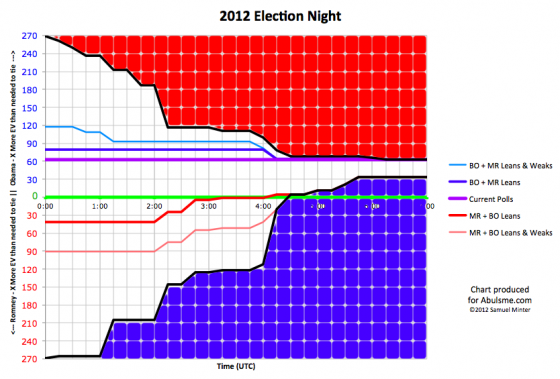 If the polls were very generally right, you would expect a horizontal line very close to zero. If there was a direct bias for one candidate or another you would expect a horizontal line, above zero for an Obama bias, below zero for a Romney bias. More than that though, the less close the race is, the greater that bias is. It isn’t just that races that are less close are polled less often and so are generally further from the right answer, but rather the bias toward making it closer increases too. Those were the two worst states in terms of accuracy of the five poll average. Rounding out the worst five are Alaska (R+9.6%, a big exception to the trend… where there were no polls at all and the 5 poll average was based on the 2004 and 2008 elections), Tennessee (O+9.4%), Kentucky (O+8.2%). The best five were: Maine-1 (O+0.03%), Texas (R+0.2%), Virginia (R+0.2%), Washington (O+0.4%), Georgia (R+0.4%). Now, in the end, the degree to which each candidate wins (especially in the states they are way ahead in) doesn’t really matter. We have a winner take all system, so this bias actually makes a lot of sense in terms of how pollsters work. Having the margin wrong doesn’t matter much in these kinds of races, only the winner matters (and the poll averages were all correct on that front). Also of course, close races are more interesting, and people are more likely to commission polls if it looks closer… so the biases all make sense. Now, I had categorized using “Strong Romney”, “Weak Romney”, “Lean Romney”, “Lean Obama”, “Weak Obama”, “Strong Obama”. Lets look at how things stacked up in terms those categorizations… specifically the “lean” states. You can see from the chart above, that even among the states near the “tipping point” where you would think polling would be most robust, the error is significant. The tipping point is of course on Obama’s side, since he won. But what we see is that of states that the last five poll average identified as “Lean Obama”… that is, Obama ahead, but with a margin under 5%… so close enough you could conceivably think Romney might take it… only TWO actually ended up with margins under 5%. That would be Florida and Virginia. On the Romney side, there were less close places to look at. There were no cases where the five poll average classified something with Romney having a greater than 5% where it ended up being closer than that. There was ONE case where the five poll average showed a close race where it really wasn’t. That would be Nebraska-2, where the five poll average showed only a 3.8% lead. In fact, Romney won Nebraska-2 by 7.2%. The lesson in all this for 2016? Probably just that “Lead under 5%” isn’t enough to actually think that a state has a real possibility of going either way, that it is really up for grabs. Especially if the form of bias evident here (bias toward the races looking closer than they really are) repeats next time around, which I think is a reasonable assumption. Some tighter criteria is needed. Maybe just a narrower percentage lead, but maybe also something else. Perhaps an actual history of the lead bouncing back and forth, or the actual current set of polls including results going both way. Of the five closest states based on actual results (Florida, North Carolina, Ohio, Virginia, Colorado) only Florida had even one of the last five polls indicating the opposite winner (although North Carolina and Colorado had last minute polls showing a tie). Of course five results showing a lead of 0.1% should probably be considered differently than 5 results showing a lead of 4.9%. The more mathematically proper thing would probably be to take into account the margins of errors on each poll, and come up with an actual probability of the result being on the opposite side than the simple five poll average. There is a place for more complicated models (and I love them!) but part of the point of my analysis is that you can come up with results that are essentially just as good through very simple models with no fancy stuff, just simple averages. If we went by a rule saying we would only consider a state to be a true toss up if at least one of the last five polls showed a different result, then on election eve 2012, the only Toss-Up state would have been Florida. I have yet to decide what I will do in 2016, but considering Florida to be the only true toss-up seems closer to the truth than the analysis that put the seven entities in the table above (and NE-2) in the toss-up category. This analysis is also posted on my Election 2012 Wiki where you can see the original analysis as well. 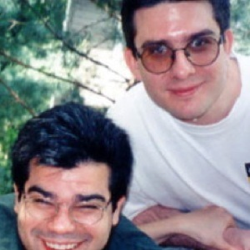 Curmudgeon’s Corner: We’re talking about 1996! With all the talk of demographic trends favoring the democrats I thought I would just pull some really long term past data and see what the trends look like. The chart above is the Democratic percentage of the Republican/Democratic popular vote. That is, it leaves out third parties, even though they were significant in some of these years. And even though I generally prefer looking at the electoral college in Presidential elections, for this purpose popular vote seemed better. The one thing that immediately stands out to me is actually not a trend toward Democrats, but a “dampening” effect. The numbers were so much more volatile prior to 1976. 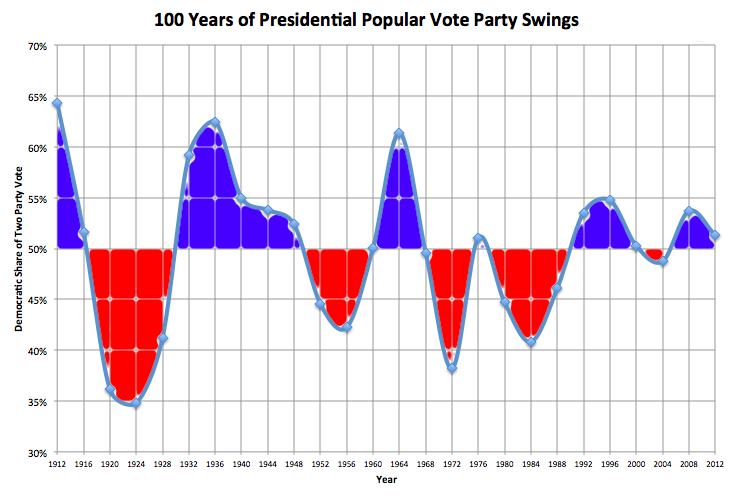 I’ll skip the big 1912 to 1924 swing because 1912 was an oddball election… the Republicans actually came in third behind the Democrats and Progressives. But looking further on for examples, we went from Calvin Coolidge (R) blowing out John Davis (D) in 1924 by a 65.2% to 34.8% margin, to Franklin Roosevelt (D) crushing Alfred Landon (R) by a 62.5% to 37.5% margin only 12 years later. That is a LOT of people flipping from Republican to Democrat. Now, admittedly, there was a little thing called the Great Depression that probably caused that swing. But still, it is a HUGE number of people moving from one party to the other compared to what seems possible today. A slightly more recent big swing… In 1964 Johnson (D) beat Goldwater (R) 61.3% to 38.7%. Only 8 years later in 1972, Nixon (R) beat McGovern (D) 61.8% to 38.2%. Again, there was a major event, the Vietnam War, that could explain this, but this still represents a HUGE number of people switching parties. Not just demographic trends, but people actively switching their support. In addition to big swings, margins in general tended to be bigger. From 1912 to 1984, 13 of 19 elections… over 2/3 of the elections… were won by margins greater than 10%. The last time that happened was Reagan’s 1984 win over Mondale. 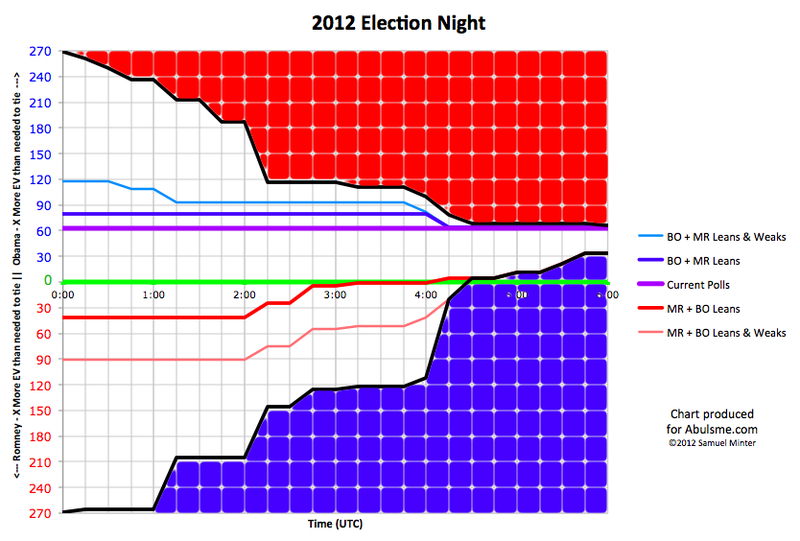 We have now gone 7 elections in a row where the elections were one by less than a 10% margin. Of those 7 elections since Reagan, the margin was less than 3% three times. From Woodrow Wilson in 1912 to Ronald Reagan in 1984, there were also only three elections… out of 19 elections… with a margin under 3%. (That would be 1960, 1968 and 1976.) Elections this close used to be really rare. They aren’t the “norm” now, 1988, 1992, 1996, and 2008 were all won by more than 7%, but under 3% is certainly no longer rare. Now what about that trend toward the Democrats? Now, looking at the full 100 years, the oscillation between the parties and the reduction in volatility is the biggest thing you notice, but you could argue that the politics and issues and how the parties were aligned was dramatically different prior to the 1970s. So, if you look selectively just at 1972 onward, you do see a trend toward the Democrats. In the 70’s and 80’s you had big Republican wins and the only Democratic win was a squeaker. In the 90’s and 00’s you had smaller Democratic wins, with the only Republican wins being a popular vote loss in 2000 which was won in the electoral college, and a narrow win in 2004. If you change your starting point though, and look just since the 1990’s, the trend is (slightly) back toward the Republicans. Obama’s two wins were by smaller margins than Clinton’s wins. The important thing to remember however is that parties change over time. The Republicans of 2012 are nothing like the Republicans of 1988. And the Republicans of 1988 didn’t look much like the Republicans of 1964. How much any demographic trends affect future presidential races will depend a lot on the internal dynamics of both parties, and who they nominate, and if the parties start shifting around as they do periodically. If the Republicans figure out how to embrace rather than alienate the non-white groups that are growing rapidly, then they will be able to blunt or reverse any demographic trends. Or we could have a major event like the Great Depression or the Vietnam war that returns us to the days of huge landslides for whichever party is NOT blamed for the bad event, with huge swings between the parties in short periods of times. We’ve been in a period of relatively close elections, with relatively little volatility between elections. That seems to be unusual looking back at the last 100 years. It could be the new “normal” that lasts another 50 years. But it just as easily could be an anomaly, and we’ll return to “normal” soon. As usual, past performance is not indicative of future results, but it is fun to look back at the longer term history for some context. 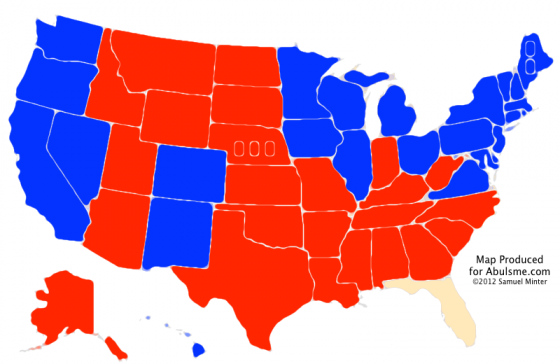 Electoral College: Nov 10 18:00 UTC – Florida finally called – For Obama – 56 of 56! Just before 18:00 UTC today, Florida was finally “called” for Obama. 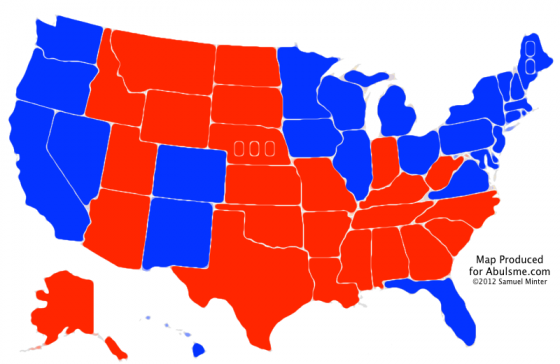 Absent any faithless electors, this makes the final electoral college results Obama 332, Romney 206. As those of you following my electoral college tracking this year know, not only was that the final state of my “Current” line on election day, but it is also by far the most common location of the race in the daily updates covering the whole year. As I’d said quite a few times, 332-206 just seemed to be where this race “wanted” to be. 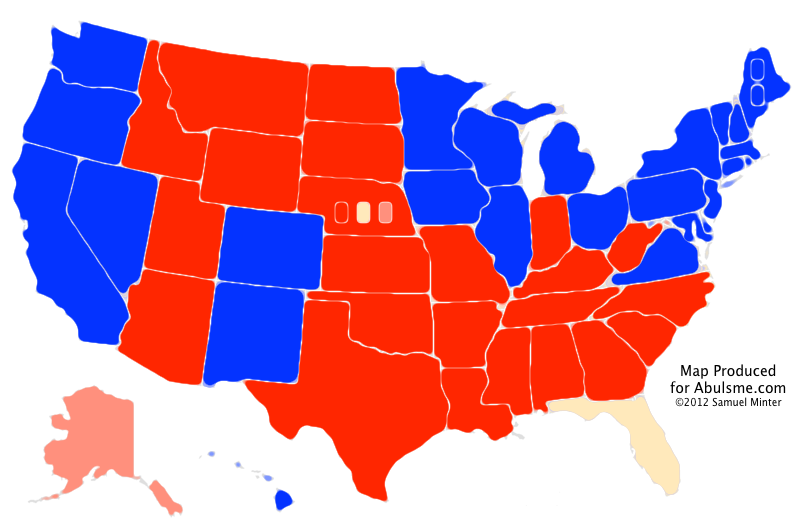 Sometimes events would move the polls slightly further in Obama’s direction, sometimes slightly further in Romney’s direction, but 332-206 seemed to attract the race like a magnet, and things would revert back to this state. When things “reverted to the mean” this is where they went. Also of course, looking at the daily updates going back to January, Romney was NEVER ahead in this electoral college analysis… or any other electoral college analysis. Aside from a few days in October where Romney was threatening to take the lead (but never did) the question was never if Obama would win, but rather by how much. But yet reports are that the Romney campaign, and Romney himself, were shocked by the fact that they lost. They really truly did not believe the overwhelming consensus from the pollsters. One final point. There are quite a few more complicated models out there doing electoral college analysis. They provide potentially more detail and more kinds of insight than mine, but part of my point in doing this exercise is that even a very simple “last five poll” average can get you very good results. The marginal value from added complexity doesn’t really seem to get you that much more. This isn’t to say that there isn’t value in that complexity. There is. And if I had more time, I’d certainly be tempted to make a more complex method of analysis myself. Note added Nov 11 00:25 UTC: I have some final clean up to do on it yet, but the archival wiki page with all the information from this general election season is here. The earlier wiki archiving the primary season is here. Edit Nov 11 00:34 to change some awkward wording. I needed to pause to take my wife to the airport, so I couldn’t make this update earlier, but shortly after 06:00 UTC, Alaska was called for Romney. This means so far the five poll average has called 54/54 contests. Only Florida is left. Even if it ends up missing on Florida, that is pretty good… It is better than it did four years ago. If I do this again in four years, I may end up doing some things differently based on things I’ve learned this time around, but for the most part I’d say this exercise has been a success. And lots of fun, if somewhat exhausting in the last month. I have no idea if Florida will end up being called in the next few hours, or if it will end up going almost 15 days like Missouri did in 2008. Thanks again for following my coverage this year. It has been a blast! 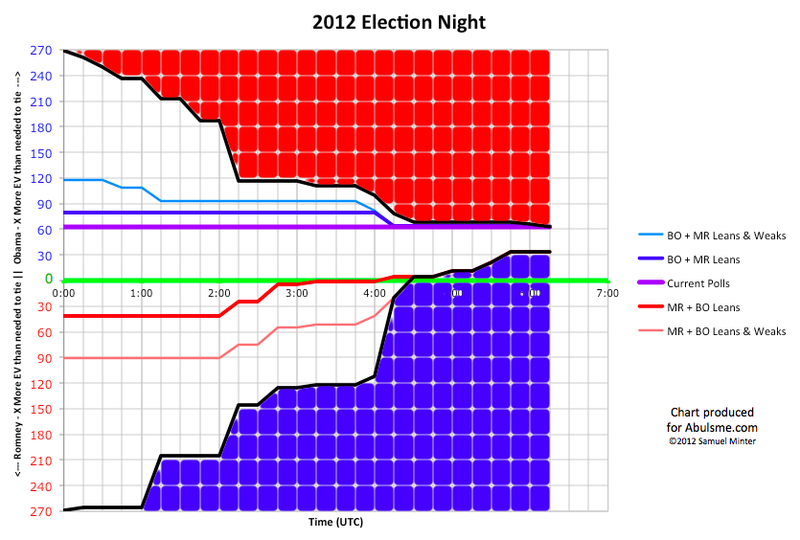 The two remaining Nebraska congressional districts were called for Romney shortly before 06:00 UTC. As of then, that left Alaska and Florida outstanding, but only Florida was ever really in question. And this wraps up the live coverage of Election 2012 from Abulsme.com. I have to take my wife to the airport now. Alaska was actually called for Romney already, and I’ll include that in a 6:15 update when I get back. And then we wait for Florida to tell us if we do indeed end up at the magical 332-206, or if we end up at 303 to 235 instead. I’ll make a final update once the results in Florida are known. And then a really final update once the electoral college votes in December, just in case there are any faithless electors. But for now, thanks for joining Abulsme.com for the election coverage all year long. The five poll average’s streak continues.